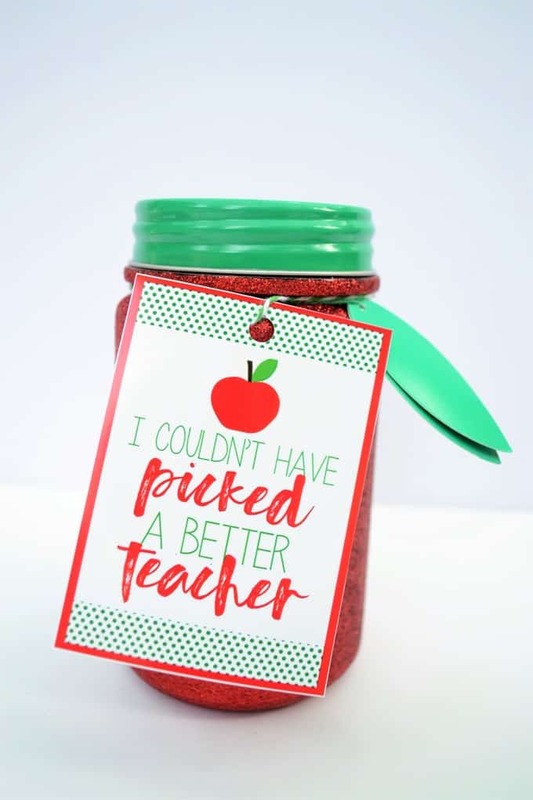 Teachers are so important, and I love sharing easy teacher appreciation gifts that are inexpensive and fun! 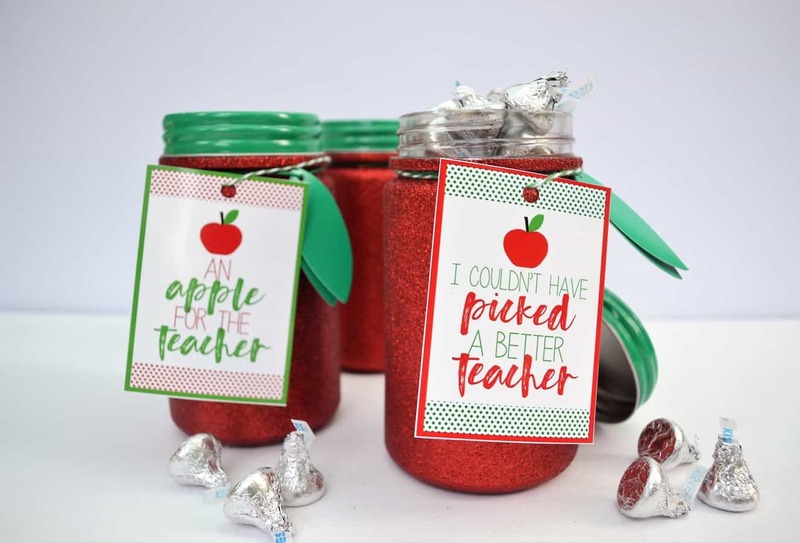 Make this for back to school, give as a Christmas gift, give for teacher appreciation week or the end of school, and fill with your teacher’s favorite treat! It’s hard to believe how quickly summer is passing us by. Soon, it’ll be time to get start preparing for back to school! 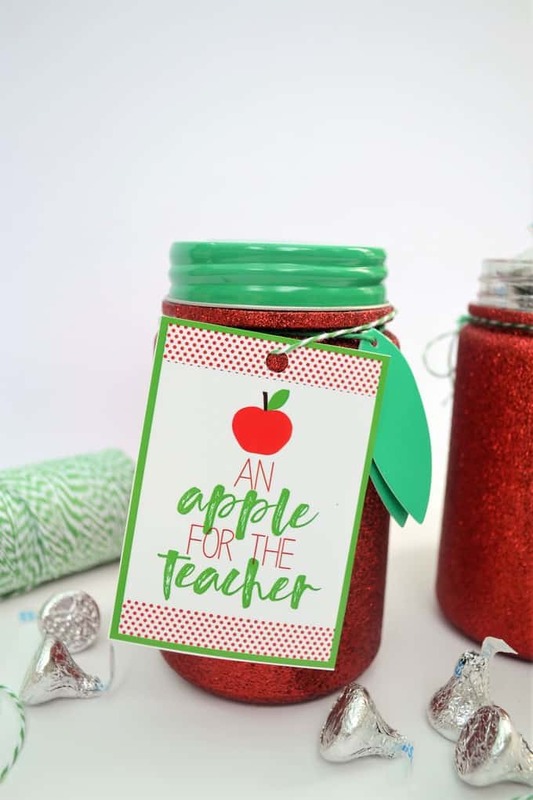 Today, I’m sharing this super-easy and totally adorable teacher gift idea plus free printable tags! 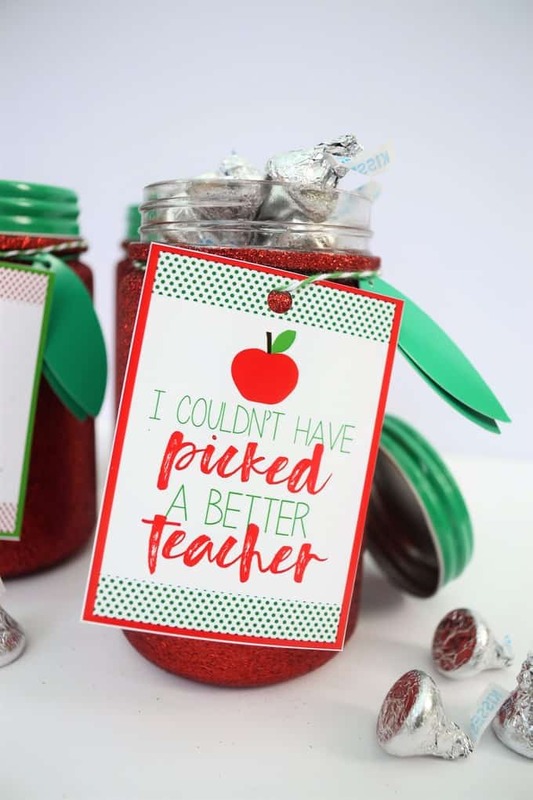 Make for a teacher appreciation gift and fill with your teacher’s favorite treat! Such an easy gift idea. 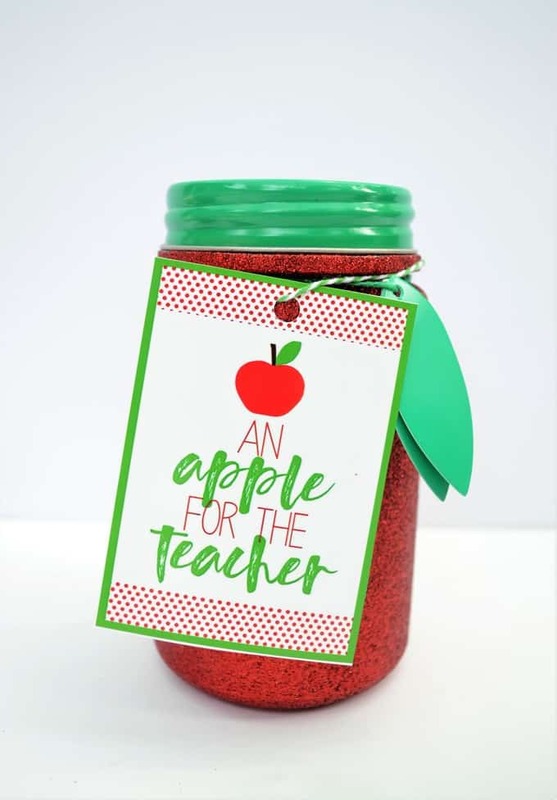 These apple-themed mason jars are just the star of this gift, in my opinion. You can try to purchase something similar (these are from Target), or you can create them yourself! Just take a plain mason jar and apply a coat of Mod Podge to the outside. Apply a layer of extra fine glitter and let dry. Apply a second coat of Mod Podge to seal. Spray paint the lid a bright green, and you’re done! Take your jar and fill with a favorite candy (or this pretzel candy would be a fun addition!) . Print out a gift tag, and attach to your jar with some bakers twine. Click on the file you’d like to download, and save to your computer. This file prints best at 5×7 (they’ll be 2 tags per sheet). Cut out, punch a hole at the top, and attach with twine to your gift! 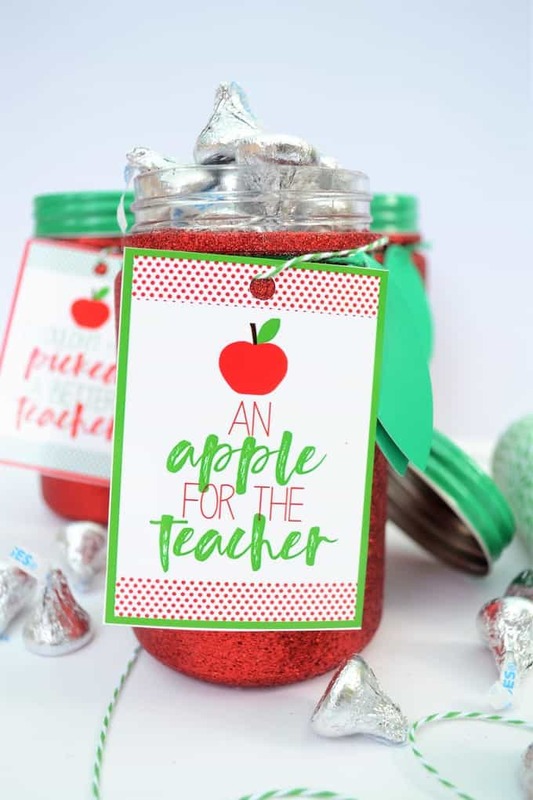 Thanks for reading all about our TEACHER APPRECIATION GIFT IDEA + FREE PRINTABLE GIFT TAGS! Have a crafty day! What a cute gift! Every teacher needs a little stash of something sweet! 🙂 Super fun idea! Visiting from Create Link Inspire. These teacher printables are so nice. Thanks for sharing. Super cute! Anything stuffed with Hershey Kisses sounds good to me!! Visiting from Sew It Cook It Craft It party. This is adorable! Pinning in my back to school board. I might have to make these!